In all 3 clashes, there is a mechanism which lays the foundation for conflict and escalates hostility into confrontation, made up of 5 themes: involvement of external forces, the characteristics of the regional demographics, the media and general public perception, economics and government policies. The root behind all these conflicts is change in a society and the reaction to change. Immigration is an agent of change, as it disturbed the status quos and existing demographic in these 3 communities. This is not to say that immigration itself is inherently provocative, but simply that it initiates change to a community. As politcal scientist Daniel Hopkins claims, a change in the number of immigrants rather than the absolute number of immigrants has a bigger impact on a community. We see this borne out in India clearly. The capital, Delhi, has the highest percentage of immigrants (38.4% in 2001), but it does not have any regionalistic parties and experiences less conflict than Mumbai, which is just 26.5% immigrants. However, Mumbai’s percentage increase is greater at 5.4%. In the US, the Carolinas experienced the greatest percentage increase in their Hispanic population between July 2007 to July 2008 (7.7% and 7.4%). This has resulted increased hostility against the immigrants even though the total percentage of the Hispanic population in these states is small. How the indigenous members of the community react to this change in demographics, and how the indigenous and immigrant populations interact afterwards, decide if conflict arises. The above examples suggest that the size of the immigrant population is important as well. The case of Delhi points out that if the immigrant minority becomes large enough, there is less backlash against them. This is also the case in Singapore where the immigrant population, including non-residents and immigrants who are naturalized residents/citizens, is 42.6%. Similarly in the US, New Mexico with a 45% Hispanic population has less anti-Hispanic sentiment than Florida with 21%. Fundamentally, the lack of understanding between native and immigrants populations leads to conflict because it breeds the propensity for both groups to ‘flatten’ the other’s identity. This leads to both groups becoming capable of injuring each other, as they no longer see each other as fully human. How immigrants behave in their new society can contribute to the 2 groups’ dehumanization of each other: when immigrants fail to be assimilated, the groups view each other in terms of differences instead of commonalities, thereby creating hostility. In America, because immigrants typically gravitate towards areas with a high percentage of fellows from the same ancestral country, parallel immigrant communities form alongside the locals. The resulting scarce contact between the majority and minority populations frays their relationship; studies show Americans view immigrants unfavorably if they have little interaction with them. The same applies to Mumbai, where Marathis and Muslims lived so separately that the Shiv Sena party deprecatingly referred to a “little Pakistan” in Mumbai. After a lack of understanding has been established, natives are prone to singling out or imposing certain traits on immigrants. Such was the case in Mumbai, where Muslims were labeled as one community solely based on religion, ignoring the spectrum of languages and religious sects they represented, such as the Sunni/Shi’a divide. The term ‘Mexican’ used to indicate all Hispanics, be they Mexican or Peruvian or Cuban, is the US parallel. 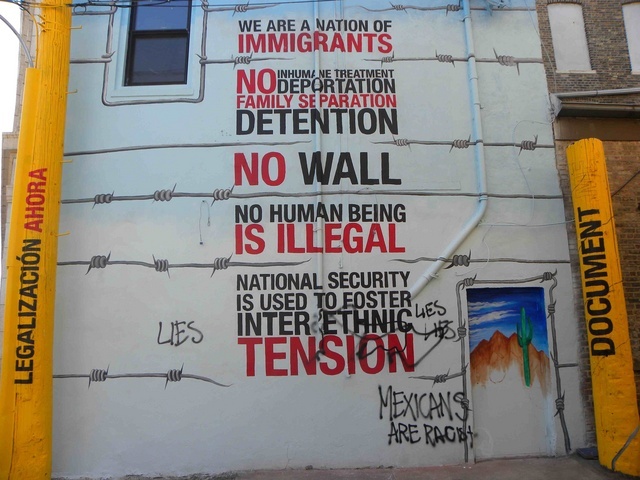 Stereotyping runs rampant in such an environment, with both Hispanics in the US and Muslims in Mumbai generalized as ‘primitive’ and ‘uncivilized.’ Once this reduction of people to a few (often false) characteristics occurs, the majority population does not consider immigrants as equals. In US immigration debates, the media buzzword “real American” indicates immigrants lack the legitimacy of natives. ‘Mumbai’ itself is a manifestation of this prioritization of majority groups, as the city was officially renamed (from Bombay, in 1995) to the name Marathis had always used for it, and after a Hindu goddess. Immigrants also are perceived as not fully human; during the riots in Mumbai in 1992–1993, a Hindu rioter recalled, regarding a man he and his companions burned to death, “All I thought was that he was a Muslim.” In the case of Singapore though, first the media is shackled by the government from promoting any antagonism toward immigrants and secondly the immigrant population is usually more educated and richer than the average and thus there are rarely hostile attitudes towards them. In an environment where natives already do not regard immigrants as equal human beings lower median age and education levels lead to poor economic conditions which can drive a wedge between them by breeding resentment. As James Roland Forrest Jr’s research points out, class divides based on these other factors led to more long-term violent attitudes. The majority of Muslims in Mumbai did not go to Pakistan after the Partition, as they were largely working class and not economically capable. As a result, they remained in competition with Hindus for jobs. In harsh times, competition for self-sustenance is intensely objectionable, and natives either label immigrants a burden, or the cause of economic failure. In America, currently undergoing its worst financial crisis since the Great Depression, the first scenario applies, as conservatives demand the tightening of immigration laws. The median age of Hispanics in the US is 9 years lower than the national average leading them to be poorer and less educated and thus easily discriminated. In Mumbai, the second form, scapegoating immigrants, was reflected in accusations that the Muslims had a high birthrate to purposely damage the economy. Furthermore, the percentage of migration to slum areas is 38.8% for Uttar Pradesh and Bihar, the states from which most Muslim immigrants originate. Both scenarios identify expulsion of immigrants as the solution to economic turmoil. In an atmosphere charged with tension from lack of understanding between groups and economic instability as incentive for resentment, ineffective government policy can provide the catalyst to full-blown conflict. When ultranationalist parties hold enough power, they can spark people to turn against each other violently, as the Shiv Sena did after it won the Maharashtra state elections. The party’s relentless propaganda denigrating Muslims as a “burden” and “untrustworthy” barraged Mumbai’s people in the mainstream media through the Sena’s newspaper (Saamna). This contributed to the previously discussed stereotyping and dehumanizing of Muslims, and allowed the Sena to orchestrate the 1992–1993 riots. The party’s Sainiks (“soldiers”), in coordination with the Bharatiya Janata Party, destroyed the Babri Mosque in Mumbai to incite the Muslim population. It worked. During the ensuing riots, the Shiv Sena identified Muslim homes and businesses for the Hindu mob to target. Similarly, the MNS through its right-wing Marathi stance has tried to grapple power away from the Shiv Sena in recent years by increasing violence against the immigrants unrestricted by their religious sentiments. America has not experienced similar violent outbursts in the context of modern immigrant-native relations. There is firm government data that despite the proclamations of the media and the Southern Poverty Law center, hate crimes against Hispanics have in fact decreased. One possible reason is the State’s liberal politicians, such as former president Bill Clinton, who said, “immigrants are good for America…They are reminding us all of what it truly means to be an American.” Another reason for this is systemic: the bi-partisan government moderates extremities. With different viewpoints jostling in the mainstream media, neither can wield devastating influence. In Singapore, where radical alternative political groups struggle to form, government policy is the overriding reason conflict was prevented, as we shall explore in the Resolution section. I happen to land to this site and it is a good written read, a tad bit on the short side, but a fairly sufficient one. I really like the layout too, it is very simple to navigate. Welcome to Nations Borders Identities Conflict. Navigate individual conflicts with the provided links or use the search feature to cross-reference topics.